Sign up to be a distributor today! Live Action is currently distributing the Summer 2013 edition of The Advocate (which you can read online here), the national student magazine. While Live Action is known for our undercover investigations, The Advocate is one of the strongest tools to help change hearts on abortion and save lives. Often, people don’t know the realities of what goes on in the abortion industry. Plenty of people don’t even know that Planned Parenthood does abortions, for example, let alone the multitude of crimes that Live Action has uncovered through investigations. The Advocate is a great tool to not only start conversations about the realities of abortion in America, but also to get facts in people’s hands. The Advocate currently works with over 1,200 distributors – not only in all 50 states, but internationally as well. The distributors are high school students, college students, and young professionals. And Live Action is looking to add more. Would you be interested in joining The Advocate as a distributor? 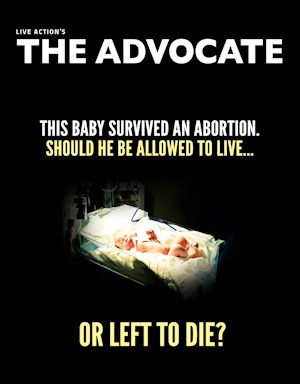 Live Action’s exposés of the abuses and lies of the abortion industry will be meaningless if we can’t get the truth to the public, and The Advocate helps us to do that. By becoming a distributor, you can help build a culture of life in your school or community, and help us save lives. Join us, and help make a difference. Sign up to be a distributor today.